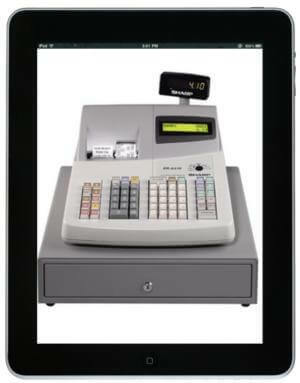 iPad: "All Your Cash Registers Are Belong To Us"
No waiting on lane 5. No waiting on lane 5...actually, don't move, we'll bring lane 5 to you. Part of the magic of the iPad is that we keep coming up with new ways in which it can revolutionize entire industries. From education to e-books, tablet computers are helping everyone re-imagine how they do business. Retail is no exception. There’s a growing trend among store chains big and small to switch from clunky cash registers to smooth mobile devices and tablets. But it doesn’t stop at checkout: sales clerks roam aisles ready to update inventory, help you buy missing items online, make sales as you shop, and much much more. Home improvement giant Lowe’s just bought 42,000 handheld point of sales devices for its 1700+ outlets. Their competitor Home Depot already spent $64 million placing 30,000+ of their First Phone mobile devices (modeled on Motorola tech) in their stores. Nordstroms has 6000 such devices, and Urban Outfitters, and Pacific Sun are following suit. Mobile and tablet technology is changing the way we shop, and it’s only going to get more prevalent from now on. In-person purchases are now powered by Apple. When it comes to updating your checkout for the 21st Century, you have many different options, both in hardware and software. For smaller businesses there’s Square, whose tiny box like card reader will plug into smart phones and iPads to transform them into registers on the go. We’ve already discussed how the startup, handling $4 million+ in sales every day, is the go-to option for retailers not big enough to play hardball with credit cards and their fees. ShopKeep has a similar appeal. Larger chains, however, look to the likes of Verifone that which has handheld point of sales devices as well as more traditional sales platforms. Global Bay, meanwhile, can give you a variety of mid-range solutions based on adapting iPads and smart phones into registers, inventory trackers, or even customer-friendly kiosks. Their app is actually free at the Apple store. If these mobile solutions were simply replacing the standard checkout process, they wouldn’t be much to talk about (except for Square, but that’s because they’re changing price structures as well). What makes tablet and smart phone in the retail environment interesting is that you get the regular sales stuff plus all the capabilities we’ve come to expect from modern mobile gadgets. Lowe’s says their 42k+ devices (which you’ll see in stores by the end of January 2012) will help clerks do mundane things like update inventory, but they’ll also let them show how-to videos to customers, or help them browse Lowes.com while in the aisles. Global Bay (which is the service that will be used by Pacific Sun in 400 stores by the end of 2011) allows employees to make online sales to customers if they run out of items in-house. Home Depot, Nordstroms, Urban Outfitters – these guys are all doing the same kind of thing. Mobile devices turn every clerk into a multimedia sales presentation, an online shopping assistant, and an information spout. Don’t let customers rethink their decisions on the way to checkout, make sales right in the dressing room. You can save trees while you’re at it. The New York Times reports that major chains like Whole Foods Market, Nordstrom, Gap, Anthropologie, Patagonia, Sears and Kmart are now using mobile devices to email receipts to customers instead of handing them paper. They’re tacking on email alerts and advertisements while they’re at it, of course, which may explain why only about one third of customers are opting in (based on results at Patagonia). Still, it shows another advantage of the inclusion of mobile at the retail outlet. There are disadvantages, of course, mainly cost. $500 tablets are easy to drop but expensive to replace. That being said, while traditional mechanical registers retail for less than $100, modern inventory tracking type digital registers are just as expensive as tablet computers, and their software can cost a store considerably more. Using smart phones as retail devices also invites misuse or theft, but I’m not sure how big of a problem that will be. Ditto for training employees on new systems. Honestly, it looks like the only true hurdle to adopting tablets and smart phones on a major scale is startup costs. Which, for new small stores, or big national chains, isn’t much of a hurdle at all. This rising tide of mobile digital sales makes me wonder about the survival of brick and mortar stores. If you had asked me earlier how many national chains would still have physical locations in 2025, I probably would have much fewer than now. Grocery stores, and other shops for daily essentials may always need to have physical locations, but e-commerce has already taken a big chunk out of the mall and looks to continue to challenge the need for real world shops. The upsurge in iPads on the sales floor, however, makes me realize that there may still be a lot of life left in your local retail chain. By bringing the power of the internet into physical locations, businesses can offer customers the best of both worlds. See the products in person, try things on, and take virtual tours of the goods that aren’t around. Pay for it as soon as you like it, walk out with it now or have it shipped to your home. Customers get digital receipts and coupons, and they can pay with digital currencies stored on their smart phones (see our earlier discussion on Google Wallet, and PayPal and the “death” of cash). Between the mobile devices in the hands of clerks and the mobile devices in the hands of customers, traveling to a real-world store will be an adventure in mixed media presentations, customer reviews linked to barcodes, and much more. Retail outlets look like another space where the merger of the digital and physical worlds is inevitable. Dozens of big name stores are at the front of this evolution in sales, and hundreds of smaller chains are riding the wave right alongside them. Give it a few years and seeing an iPad cash register, or a sales floor clerk with a mobile device in hand won’t be weird, it will be normal. A few years after that and stores without such innovations will seem outdated. Another major industry is set to get a 21st Century makeover. As always, thank the iPad.